Rheumatoid arthritis (RA) is an autoimmune disease characterized by chronic inflammation of synovial tissues in joints, leading to progressive destruction of cartilage and joints. The disease-modifying anti-rheumatic drugs currently in use have side-effects. Thus, there is an urgent need for safe anti-inflammatory therapies for RA. This study aimed to evaluate the therapeutic effect of the flavonoid quercetin on arthritis in mice immunized with type II collagen (CII). An arthritis model was established in C57/BL6 mice by intradermal administration of chicken CII mixed with Freund’s complete adjuvant. Quercetin (30 mg/kg orally) and methotrexate (0.75 mg intraperitoneally twice a week) were administered to investigate their protective effects against collagen-induced arthritis (CIA). 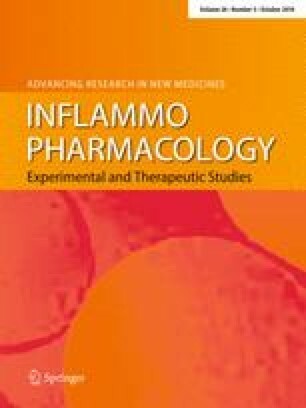 Levels of tumour necrosis factor-alpha (TNF-α), interleukin-1 beta (IL-1β), IL-6, and the matrix metalloproteinases (MMP), 3, and 9 were detected to assess the anti-inflammatory effect of quercetin. The mRNA expression of MMP3, MMP9, CCL2, and TNF-α was also measured by quantitative real-time PCR. Quercetin significantly alleviated joint inflammation by reducing the levels of circulating cytokines and MMPs. There was a significant decrease in the expression of TNFα and MMP genes in the ankle joints of arthritic mice. A significant reduction in the levels of knee-joint inflammatory mediators were observed with combined quercetin and methotrexate treatment. Thus, quercetin has the potential to prevent joint inflammation and could be used as an adjunct therapy for RA patients who have an inadequate response to anti-rheumatic monotherapy. The original version of this article was revised: the last co-author name was incorrect and swapped in the original publication and it has been corrected now. A correction to this article is available online at https://doi.org/10.1007/s10787-018-0480-2. This study was partially funded by a Grant from AITHM (Faculty Research Grant) and Arthritis Australia Grant 2015 to NH and NK. The Authors would like to thank Dr. Smrithi Krishna for her expert assistance in the gene expression studies. NH and NK conceived and designed the study; NH, SMH, KH, SH, and AB performed the research; NH and SMH analysed data; NH, AB, and NK wrote the paper.